A big part of stock picking is finding GREAT trading and investing ideas. And lucky for us, FinViz is an easy-to-use free tool to help you quickly scan for the best stock picks out there! So this article will teach you some of my favourite tips and trips to to help you get started with FinViz. By the time you’re done reading, you’ll be very comfortable finding your own stock picks with FinViz. 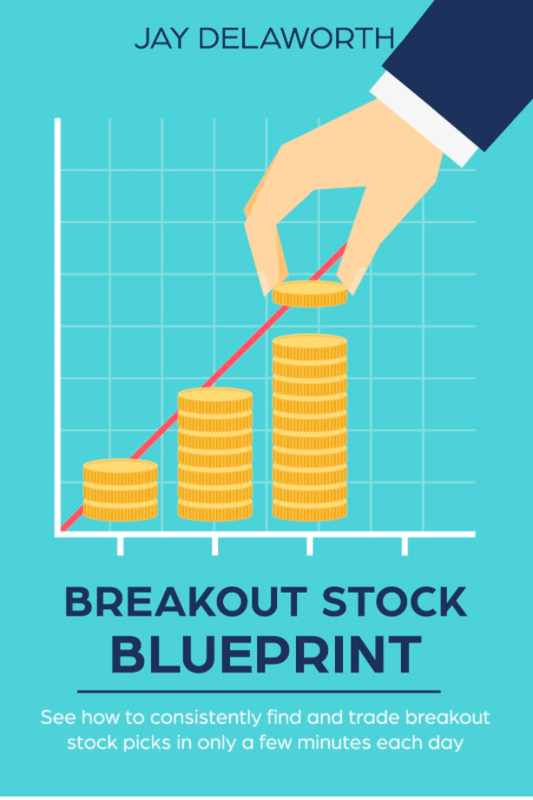 Even though this blog promises to give you a LOT of information about finding the very best stock picks on Finviz … you can really kick-start your learning by getting your free breakout stock starter kit! It’s helpful stuff. Once you can consistently find and trade profitable breakout trade ideas, then the stock market becomes your personal piggy bank. Seriously! Now I know: You might be skeptical this article is your golden ticket. And I don’t blame you. But once you’re experienced with Finviz, you’ll be able to sort and sift through the market at ease! (3) You’ll be able to quickly find the ideas that look best to you! The great thing is how easy it is to use FinViz. And you can get started in almost no time. Throughout this extremely detailed article, I’ll be sure to share links to my favourite stock screens so you can easily hit the ground running. So believe me, I’m really excited to show you how to make this happen. 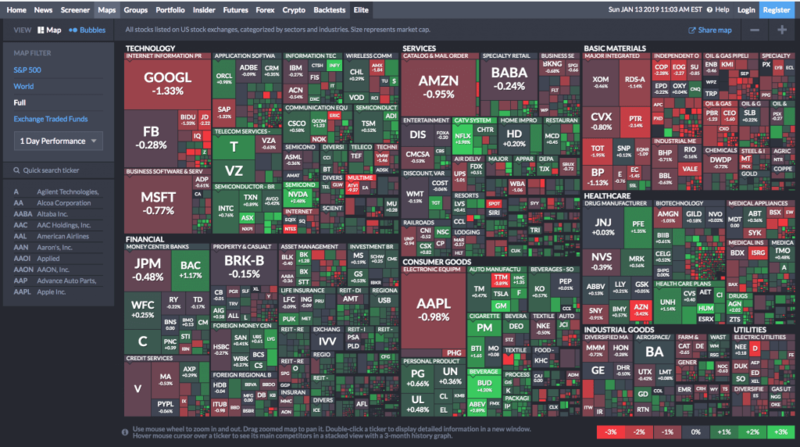 Heatmaps, Sector Scans and Other Handy FinViz features! By the time you’re done reading, you’ll have NO trouble getting started with FinViz! And best of all, you’ll be able to find exactly the types of stock ideas you’re looking for. The FinViz Stock Screener is my #1 destination when it comes to finding breakout stock trade ideas. Bookmark the link! http://finviz.com/screener.ashx?a=128563647And in case you’re wondering, the reason I like FinViz so much is because it has both fundamental and technical screening criteria. This means you can see the technical trend of your stock but, you can also look under the hood and find out how the company behind the ticker price is performing. While I’ll show you all kinds of different screening strategies below, I’m personally most focused on stocks and ETFs, and I do often take fundamentals into account. Avoiding stocks that have big fundamental weaknesses or are drastically overvalued. In terms of these items above, notice #1 is focused on technical analysis, and #2 is focused on fundamentals. So that’s why FinViz is such a good choice for me! It has one tab in the stock screener for each of these. And you know what the best part is? 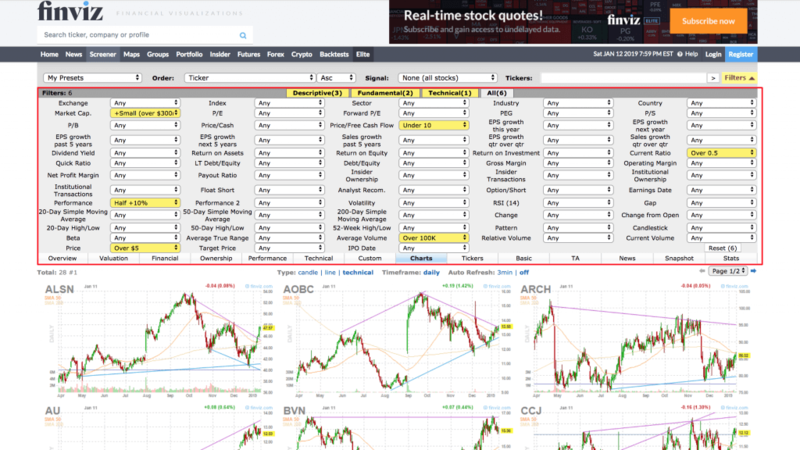 FinViz makes all this stock screening very easy! So even if you’ve never traded based on technical analysis, or looked at a financial statement, you can just follow my FinViz recipe to find intelligent trend following ideas that are worth further research. 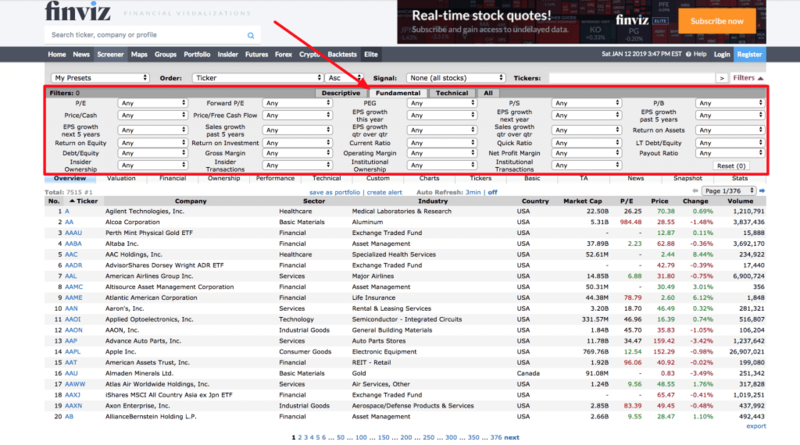 Now that you’ve bookmarked the stock screener, let’s get into the details of how it works! As you can see, these are pretty useful factors for narrowing down your universe of stocks! Just with this tab alone you can really hone in on different types of investments. One of the other great things about FinViz is there’s a little question mark beside each of the fields. So if you ever forget what one of the screening criteria means, you can just hover your mouse over it to get more information. Another handy tip when using FinViz is the screen results display as URLs. So you can actually bookmark any screen result and load it up on any given day to see what stocks are available. Cool, right? And that’s just the tip of the iceberg! FinViz really does give you a ton of different ways to explore the universe of publicly-traded stocks and ETFs. So personally, I find the descriptive tab is a great place to start my stock screening research. That’s because it’s an easy place to decide what type of stocks you want to look for. And from there, you can further sort and splice the results by changing the fundamental and technical specifications of what you’re looking for. That’s why I recommend you take some time to look around the descriptive tab and get familiar with how you can refine your stock selection with all the different variables. The only limit is your imagination! Now, let’s keeping move because there are two more tabs to introduce you to before we actually start screening for individual stock ideas! One of the tenets of my Intelligent Trend Following trading strategy is to focus on high-quality companies. That’s because in my experience these kind of stocks really have the potential to trend for months, quarters or even years on end. And that can lead to BIG wins in your portfolio! The great thing is, FinViz makes it easy to find high-quality fundamental ideas (or even just eliminate those stocks with higher-than average fundamental risks. Maybe you want companies with strong balance sheets earning a healthy return on investment, maybe you’re looking for EPS positive companies that are growing sales quickly, or maybe you’re searching for under-valued companies with large margins. The point is: The fundamental tab has a lot you can do with it! So let me show you one of my fundamental screens, which uses the following metrics. EPS growth next 5 years and next year are positive because we want companies that are growing earnings. Plain and simple. Trends aren’t as likely to continue if earnings growth is slowing down. Return on Investment and Return on Equity should be above +0%. Again, we want companies that are making money and not losing it. These return hurdles are low and will allow a lot of companies through the screen, but they’ll help you avoid a couple potential dangers too. Debt/Equity is under 1 to help us avoid companies that have too much debt. This isn’t a perfect measure by any means, but it does reduce the chances of finding a company that will go bankrupt tomorrow and provide an abrupt end to your trend. Make sense? The idea with this screen is to cast a broad net and avoid the worst fundamental companies – like those earning negative ROI or with very large debt loads. On the other hand if you’re shorting, you could also choose to focus on unprofitable companies that might be more likely to keep dropping. At the end of the day, my buying and selling decisions tend to be driven by technical analysis. But by limiting my universe of trading ideas to stocks that have some fundamental support, I can help increase the odds of finding uptrends that are going to last for a long time and really make a difference to my bottom line. Make sense? I encourage you to play around with this tab a little more, especially if you’re a longer-term investor who can benefit from focusing on fundamentally strong stocks! 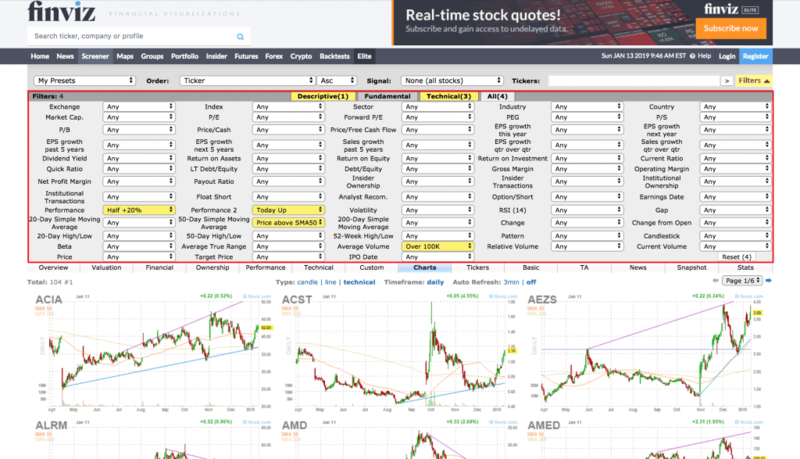 Next, as the final part of our introduction to FinViz, let’s take a look at the technical tab of the stock screener to discover just how we can find stocks that are breaking out right now! When it comes down to it, most traders really just want to focus on technical analysis. 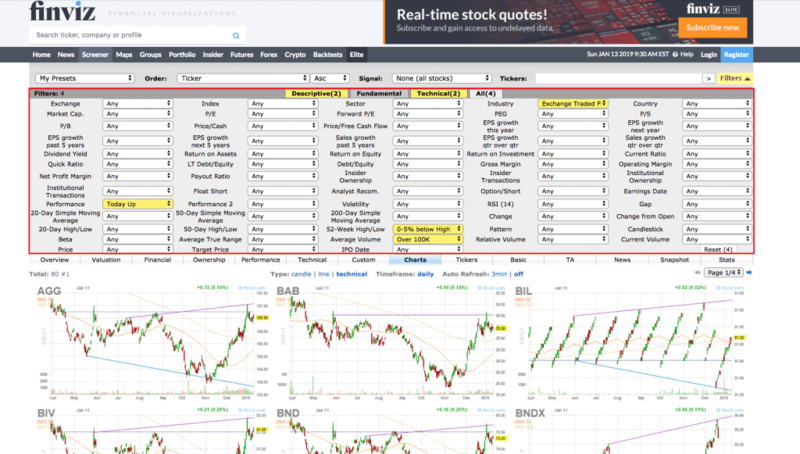 And the good news is, FinViz provides all the tools you need to find technical breakouts on a daily timeframe. The great thing about the technical tab is that all the fields are pretty self-descriptive. You can find stocks based on their relation to moving averages, their performance over different time frames, and whether they are hitting new highs and lows. As a trend follower, I personally like to use the technical bag to find stocks that are moving higher in uptrends. With the FinViz stock screen, there are a number of ways to do this on the technical tab. Screening by SMA20 above SMA50 and SMA50 above SMA200 is a great way to find stocks that are in strong long-term uptrends. These up-sloping moving averages are very indicative of trends. The next thing I like to do is look for stocks that are near all-time highs. Specifically, within a few % of their 52 week highs to find those with the most momentum. The motto here is: Buy high and sell higher! Keep in mind, technical screens can work on both the long side and the short side. So all of these ideas can be easily inverted in order to find breakdowns and downtrends if you want to play both sides of the market. Here are a few more examples of technical FinViz screens that might be of interest to you. As always, I encourage you to play around on your own with the technical screener. The thing I like most about FinViz is the way you can bring everything together. By combining the results of your descriptive, fundamental and technical tabs you can really start to find stock picks with the most potential! When you finish setting up your screen and you’re ready to see the results, you can splice and dice the data in a number of different ways. But for trend following stock picks, my favourite way to look at results is by clicking on the “Charts” tab. Here’s what you’ll see from the screen above after you click “Charts” on the ribbon right underneath the stock screen filters. In my opinion, this ability to visually sort your results is one of the best features of FinViz. You can really quickly scan all your results and rapidly focus on the best charts of your scan. This alone saves me a ton of time every day! Now, if you want to duplicate this stock screen for yourself in real time, just click here. You’re close to getting set-up for success. But there a couple of other tips and tricks you mind helpful. So let’s look at a few more details. While the stock screen above is a great place to start finding trend following ideas, there are lots of other variables that you might want to consider. So here are some guidelines that might help speed up your learning curve. As we discussed, the descriptive tab provides another layer of filters to help you refine your ideas. I particularly like the volume requirements and the ability to filter by industry, which can be helpful for finding the strongest sectors to trend-follow. The fundamental tab can be used to look for companies with strong balance sheets, low valuations or even new growth candidates. Depending on your style of trading or investing this tab can really help you sculpt the type of ideas you find. The technical tab also has a lot of parameters that are worth playing around with in more detail. If you think hard enough, you can find a lot more ways to identify strong up-trends. For starters: I recommend trying the gap-up, Maribozou candles or strong upward channels. Now it’s your turn to get to work. If you’re looking for IntraDay data, you might also want to consider FinViz Elite. This can help you find actionable ideas in real-time. Lastly as I mentioned earlier, while I’m focused primarily on trading breakout stocks with this approach, you can also trade stocks in downtrends by inverting most of these criteria. Now, for the next part of this article let’s look at some specific stock screens that combine different descriptive, fundamental and technical criteria to filter for specific combinations of factors (like large-cap momentum or small-cap value). Depending on your preferred trading strategy, this section should have something for you! Alright, I’m excited to dig into these ides in more detail. But at the end of the day there are so many different things you can do with FinViz that I encourage you to think of this as a jumping off point for your own research and experimentation. Now in no particular order, let’s look at how you can build FinViz screens no matter what your trading style. 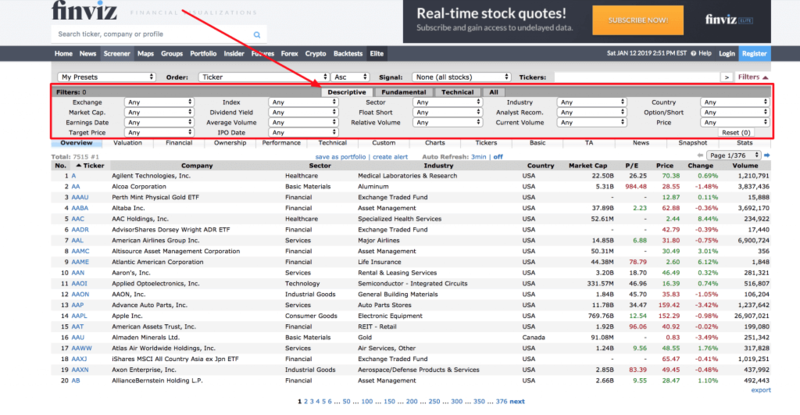 If you like to find under-valued stocks, FinVIz is a great place to start your search. The fundamental tab makes it easy to kick-off your research using whatever metrics you prefer best. First, here’s a link to the screen so you can follow along. And below is a screenshot showing all of the filters selected across both the fundamental, technical and descriptive tabs. Take a look and then I’ll explain it a little more for you below. Market Cap of $300M or larger – This is just to put a floor on my stock screen so I don’t see too many micro-cap stocks that may not have the liquidity or size necessary to really trend higher in a meaningful way. Price > $5 – Same idea as the filter above, just focused on stock price. Of course if you did want to find low-priced stocks, you could easily inverse this criteria and find yourself with a list of penny stocks. Average Volume > 100K – Again, this allows a means to find stocks that are traded actively to eliminate the spread costs of buying and selling. Debt/Equity > 1 – This is a basic balance sheet test, to eliminate any companies that have large and unsustainable debt loads. Current Ratio > 0.5 – Another simple check to ensure the company has sufficient liquidity (meaning in this case, at least half their short-term liabilities are covered by short-term assets). Performance > 10% in the Last Half Year – By insisting on a little bit of price momentum, my hope here is to reduce the chance of getting stuck in value traps that appear cheap, but only get cheaper. 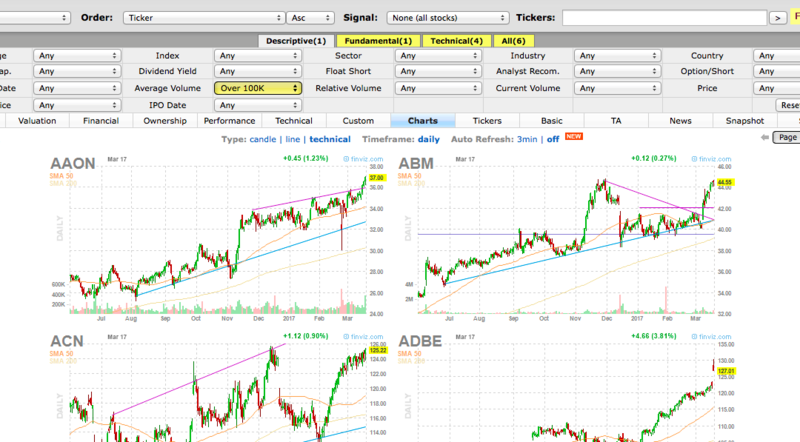 Instead I can use the technical filters to try and find those under-valued stock with a little more momentum. And there you have it! Now while I used price/cash-flow as my main valuation metric in this screen, you could just as easily use price/earning or price/book to help you find a universe of stocks that the market interprets as cheap! Next, let’s look at how you might use this free online screening tool to find dividend stocks for investment income, which are a favourite of the online investing and personal finance communities. Dividend stocks are appealing for a lot of reasons, not only do they pay out income, but usually these are also more established companies that have a track record of successful operating history. For this reason, investing in dividend stocks can be a great way to snowball your net worth. And best of all… (you guessed it! )… FinViz makes it easy! Average Volume > 100K – As usual I like to keep this as a base. Any less volume and I find the bid/ask spreads become too wide. Industry = stocks only – My goal here is to eliminate ETFs, because I’m looking for high-dividend stocks. Dividend yield > 2% – This is the low-bar for dividend stocks, and you can increase this yield requirement depending on your needs. But I find some of the best dividend stocks over the long-term are those dividend growers that start with a modest yield but increase it over time. EPS Growth Next 5 Years > 5% – The goal here is to find stocks that are likely to increase their dividends in the future. And part of that is finding those companies with forecasted EPS growth. After all, it’s hard to grow dividends if you aren’t growing earnings! Debt/Equity > 1 – Again I want to avoid overly indebted companies. Competing cash flows to bond holders can strangle dividend growth thus I want to eliminate any companies that might fit this profile. Return on Equity > 10% – Here’s another filter I layered on to focus on quality companies to ensure they’re running a profitable business wherein shareholders are earning a return. 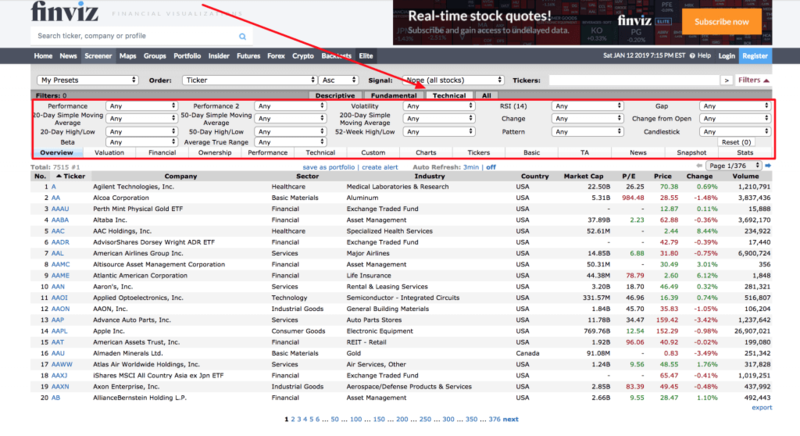 All in all, finding a list of dividend stocks on FinViz is very simple. The screen above is a great jumping off point, but you can also increase your current yield requirement or add technical filters to further find dividend ideas that are moving in the right direction. Next, let’s shift gears a little bit and look at how easy it is to scan for ETFs using the FinViz screener. 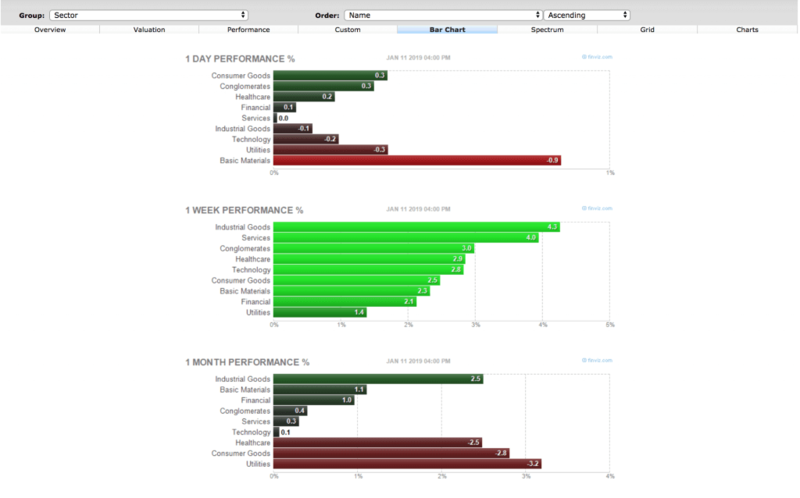 So far, we’ve focused most of our attention on how to find stocks using the powerful and free FinViz stock screener. But stocks aren’t the only thing you can find with FinViz! That’s why I also want to show you how easy it is to screen for ETFs with this online tool. For starters then, here’s an ETF breakout trade screen I put together (FinViz link here). Okay, the truth is I’m probably just scratching the surface here. ETFs are so diverse and varied that I could probably dedicate an entire blog post to them. But for now, let’s cover the essentials of this FinViz screen. Average Volume > 100K – There are lots of ETFs with minimal liquidity, so I always want to be careful to have a volume floor on any ETF ideas I’m looking to trade. Industry = Exchange Traded Fund – This is the key step on the descriptive tab to get you into ETF world. As long as this toggle is selected, you can splice and dice ETFs in as many ways as you like. New high = 0-5% below – My goal here is to find ETFs with positive price momentum that are within striking distance of their highs. Performance today = up – Not only do I want stocks near their 52-week highs, but I want to find ones that are in motion today. As simple as this screen is, it’s a great way to find pockets of strength in the market for technical breakout trading. You can also simply use it as a gauge to see what sectors, industries and areas of the market are attracting capital right now. Alternatively, you might use the pattern or candlestick technical filters to refine your search further to look for ETFs that are breaking out of a technical pattern, bouncing at support or reversing at a key trend line. There’s no limit! And the great thing about ETFs is that many brokers let you trade them free and they don’t have the individual-company risk that comes with stocks (especially during earnings season). You can also tap into other asset classes like commodities, currencies and bonds to help reduce the correlation of your entire portfolio. One risk we haven’t talked about too much is scanning stocks with too narrow of a focus. You see, the biggest problem with stock screeners is that they are completely algorithmic. That means everything is black or white, so sometimes if you are too insistent upon a particular valuation metric or threshold, you might miss perfectly good ideas. Alright, lest you think FinViz is a tool for US stocks, I want to show you how you can find international stock picks, especially from Canada. And naturally, if you’re looking for Canadian stock picks, then you just pick Canada from the drop down menu, like so! Now currently, there are 173 Canadian stocks on FinViz, and countless stocks from other countries too. This is actually a great feature because if you are bullish on a particular economy or part of the world this can be another way to get liquid equity exposure within US markets. Because if you still want to scan for international stocks – including Canada – then I encourage you to head over to Investing.com. They have a really robust international stock screening tool that can help you find companies in all sorts of international markets. To be frank with you, this lack of international markets is a weakness of FinViz. For my Canadian friends, you can read here about how to screen for stocks in Canada with Investing.ca. It’s fast and easy to get started. Plus, the steps are basically identical for all of the other countries. So even if you’re not from Canada just select your preferred geography and get started! While FinViz is a very convenient tool, a lot of these underlying stock screening principles I’m sharing here could be used in other tools as well, like Investing.com above or even your broker. And actually on that note, let me show you a couple bearish and bullish momentum screens that allow you to get a high-quality sample of charts that can serve as a great watch list to start from. First, let’s look at the bull side of the coin before pivoting back to finding bearish downside opportunities. As a trend follower, one of my favourite things to do is simply review charts of stocks that are trending up and to the right. It’s a bit nerdy, but I guess that’s just how I’m wired! As you can see, this screen is actually pretty simple. My preferred approach is to look for a wide array of stocks. Then using FinViz I can display the results as charts and just quickly browse through them. This approach allows me to look for a lot of potential watch list ideas quickly, without getting too picky and instead focusing on one of the things that matters most to trading: stock price momentum! Average Volume > 100K – This is pretty much a standing requirement for me for any trade ideas just to ensure an ample level of liquidity. Performance Half > 20% – The idea here is to focus on those tickers that are moving higher in a sustained way over time. If a stock is going to go up 100%, then it has to go up at least 20% first! As a trend follower I’m not trying to times tops and bottoms; rather, my focus is on looking for the meat of the move. Price Above 50-day Moving Average – This filter helps me focus on stocks that have some momentum in the intermediate-term as well. Performance Today = Up – I add this filter because I like to focus on stocks that are moving right now! Depending on your timeframe and requirement you might decide to change some of the specifics (such as higher volume requirements or add on a relative volume filter). But overall I think this is a great starting point to jump off from if you’re looking to find stocks with bullish momentum and the potential to keep trending higher. Another variation on this theme is I like to riff with is adding more fundamental filters. So here’s a twist with some ROE and debt requirements you can play with as well. Next, let’s flip the script and take a quick look at the bearish side of the coin. Since this is mostly a technical screen, the ability to inverse it is really easy and in bear market environments, it’s a great way to fish for quick moves lower. While most of my focus in the stock market is on the long side, FinViz is also a great way to find short ideas if you’re so inclined. And even if you don’t feel comfortable shorting, running these bearish screens can still help you gauge the help of the overall market. For example, if you see a ton of stocks showing up on the bearish momentum screens, then it’s probably a good indicator the market overall might be in a correction (so you can adjust your expectations accordingly). Once again, this is a pretty simple screen and really just the inverse of the one above. I’m looking for stocks that are below their 50-day moving average, down 20% over the last 6 months, and still heading lower on average volume above 100K shares/day. Another tweak to this screen you might want to consider is selecting ETFs only. That can help you avoid some of the risks that come with shorting individual stocks. Another exciting application of the FinViz stock screener is focused on earnings announcements. During earnings season, this filter can be a really great way to fine-tune your stock screen results and reduce risk. Let me show you how it works. One of the biggest hazards stock traders have to deal with is what to do around earnings announcements. I’ve shared how I trade earnings season in detail before. But the great thing about FinViz is that it can really help you navigate these volatile times of year. To find the earnings scan field, you’ll want to take a closer look at the descriptive tab. So when you select this filter field, you have a couple of different options. Here’s a screenshot to get you oriented, and then I’ll walk through each one. Per the screenshot above, there are a bunch of different options you can select to scan for earnings-related ideas. But the good thing is they’re all pretty self-explanatory. Stocks that are higher since reporting earnings in the past 5 days. Stocks that are down this month and have earnings next week. Stocks above their 50-day MA and reporting earnings tomorrow morning. 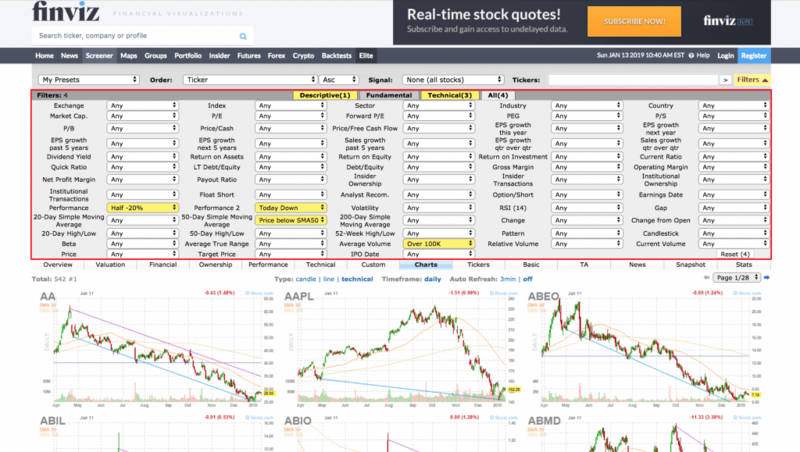 I hope by now you’re starting to get comfortable with how FinViz works, and all the different stock screening strategies you can use with it. So before we conclude this tutorial, I just want to highlight some of the other features and tools you can find for free on FinViz. FinViz Heatmaps, Sector Performance and Futures, Oh My! 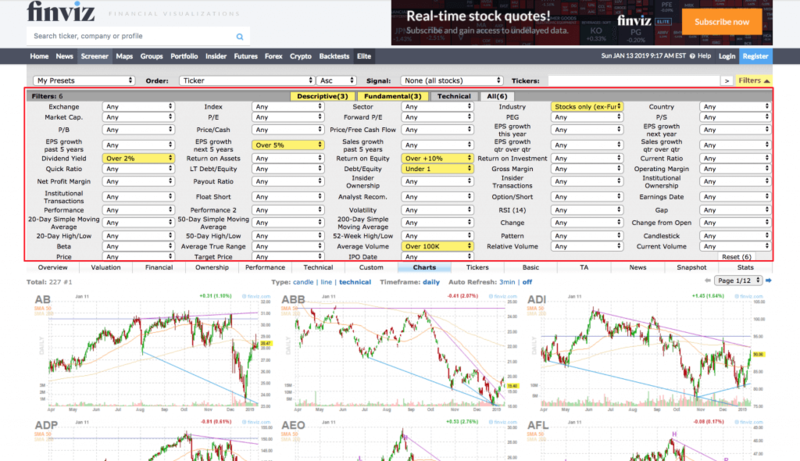 In addition to the super robust stock screening tools that you can find free on FinViz, there are a few other great tools that I incorporate to my trading workflow everyday. So let me show you some of my favourites. The idea here is these additional tools can help you get a better sense of how the market as a whole is performing. And my favourite of these is the heatmap function. It’s a super easy way to see how the whole market is performing. The idea here is you can quickly visualize how the whole stock market is doing. The default view is to show you the daily performance, but you can also go back and look at different time periods, like weekly, monthly or even yearly performance results. The reason I like this is because when I’m looking for top-down strength, the groups page can be very helpful to quickly see where the money is flowing across different parts of the market by different time frames. With just a glance you can really get yourself feeling up to date. Now the last thing I want to highlight is another FinViz tool that helps you see market performance, outside of market hours! And that’s the Futures page! Every morning before the opening bell I quickly stop by this page to get a sense of where the stock market – not to mention a variety of other assets – are set to open! This context is really helpful, and once again, it’s another great free tool that FinViz offer. Before we wrap this up, I just wanted to leave you with one a final video walking through the FinViz screening process from start to finish. This should help on the off chance you still have any lingering questions. Okay, up to this point, this article on finding breakout stocks free on FinViz has been a bit text and image heavy. So, to shake things up, I also wanted to create a detailed video to show you another easy way you can put this valuable information into action. Take a look! So there you have it: An Introduction to Trend Following with FinViz The reality is, finding breakout stock picks can be straightforward. And with tools like FinViz, you can start finding potential trade ideas fast. So I hope you’re convinced, this free online tool is definitely worth spending some time with.